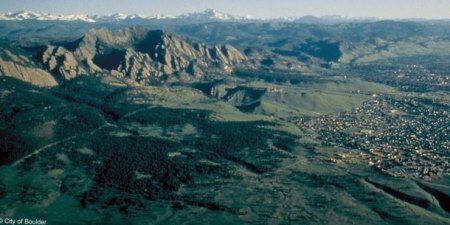 The City of Boulder’s Community Collaborative Group (“CCG”) could not agree in September on a proposed mountain bike trail running north and south through Boulder’s mountain parks, and at a PLAN-Boulder forum on October 15 a panel of mountain bikers and conservationists could not agree, either. Joe Mantione, the principal planner in the Open Space and Mountain Parks Department for the West Trail Study Area (“West TSA”), related that the CCG for the West TSA was commissioned about a year ago and consists of fifteen members representing recreation, conservation and neighborhood interests and cultural resource preservationists. Mantione recounted that the 2005 Visitor Master Plan provided for the possibility of establishing more mountain bike trails in the City’s Open Space and Mountain Parks system. Indeed, the Marshall Mesa Trail Study Area and the Eldorado Springs/Dowdy Draw Trail Study Area have subsequently authorized new mountain bike trails. Mountain bikes have not been allowed since 1987 in the West TSA, which covers the city’s mountain parks west of Broadway from Eldorado Springs Drive north to Linden Avenue. However, this summer the Boulder Mountain Bike Alliance (“BMA”) proposed a mountain bike trail stretching about seven miles from Chautauqua Park to Eldorado Springs Drive that would use some existing hiking trails and also create new links. The BMA also proposed a much shorter loop through Shanahan Ridge, as well as a bike trail from Flagstaff Mountain along Chapman Drive to Boulder Canyon by the Red Lion Inn, and another from Eldorado State Park to the Walker Ranch. At its September 15 meeting the CCG reached an impasse about the BMA’s proposed north-south trail. Consequently, Mantione explained that the Open Space and Mountain Parks staff will make a recommendation about a north-south bike trail in its report on the West TSA. That report will be reviewed in draft form by the CCG and then released to the public and the City Council at the end of January or early February. 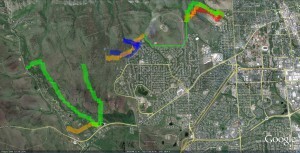 The City Council will probably make the final decision about the BMA’s proposed north-south trail in the spring of 2011. Jimmerson predicted that it would turn Boulder into a magnet for mountain bikers, and remarked that, since the population of the Denver metropolitan area is projected to increase 50 percent in the next 25 years, the influx of mountain bikers would be massive. Sprung and Vogelsberg claimed that the trail would not attract many outsiders and asserted that its major purpose would be to allow city residents who live fairly near the mountain parks to ride their bikes to existing bike trail networks north and south of the city rather than driving their cars to those destinations. Audience member Spenser Havlick argued that bikers already can use a trail from central Boulder south to Marshall Mesa to reach that area. Hartogh and Jimmerson insisted that hikers would be driven off many trails in the West TSA due to conflicts with bikers and the degradation of the hiking experience. Vogelsberg noted that a large portion of the proposed trail would be newly built for bikes and consequently would not create any conflicts. Hartogh said she had counted 26 intersections of the proposed bike trail with existing hiking trails and claimed that those intersections would cause discomfort and danger for hikers. Vogelsberg and Sprung asserted that most mountain bikers are polite, and that the reckless ones can be trained and/or disciplined to be careful. Jimmerson and Hartogh responded that a lot of bikers are carefree, young males and that a small number can create distress and danger for others. Vogelsberg maintained that during his term on the Bounty Open Space Board hikers remained the majority of users on trails open to both hikers and bikers. Jimmerson recounted that mountain bikes had been permitted in the West TSA for several years in the 1980’s and had finally been banned by the City Council in 1987 because of conflicts with hikers. He read from an editorial in the February 26, 1987, issue of the Daily Camera calling for bikes to be prohibited. He charged that the same problems would arise if the proposed trail were allowed. Vogelsberg claimed that the alignment of the proposed trail would prevent the same amount of conflict as in the 1980’s and that mountain bikers would be overwhelmingly respectful and responsible. Hartogh argued that the West TSA is a unique resource which must be preserved for future generations and that the new bike trail would degrade the natural environment. She remarked that some new parts of the bike trail would intrude into pristine terrain, such as the Sound of Music Meadow. She also predicted that trailheads would be further congested by the vehicles of mountain bikers. Vogelsberg and Sprung charged that the environmental impact of bikes is about the same as that of hikers and they noted that the BMA is asking for only a small percentage of the trail network in the West TSA. They said that the BMA would withdraw demands for any segments of the proposed trail that are shown to be likely to damage the environment. Sprung also contended that mountain bikers can provide youth and fresh energy to a graying environmental movement and that they should not be alienated by being denied access to new biking areas. Jimmerson contended that approving the proposed trail would just encourage further demands in the future from mountain bikers for more trails in the West TSA. He cited the statement, “No trails closed to bikes,” which he said appeared on the BMA’s website until about a month ago, as evidence for this fear. Vogelsberg and Sprung vehemently denied that the BMA will seek more trails in the West TSA, with the few exceptions mentioned above, and observed that the vast majority of the city’s Open Space and Mountain Parks trails are available only to hikers. Vogelsberg persistently maintained that mountain bikers deserve the same degree of respect as other citizens who use open space, that the proposed north-south trail in the West TSA would represent only a very modest expansion of mountain bikers’ access to the city’s network, and that denial of the proposal would unfairly discriminate against them. Hartogh and Jimmerson implied that mountain biking is generally just not compatible with hiking on the same trails and that the West TSA is too valuable a resource to be jeopardized by this use. Vogelsberg cautioned that the bike trails the BMA has requested from Flagstaff Mountain northwest to Boulder Canyon and from Eldorado State Park to Walker Ranch cannot be created in the foreseeable future. He said that Chapman Drive on Flagstaff Mountain is privately owned and closed to the public. Moreover, he claimed that Eldorado State Park has not been cooperating with the plan for a bike path to Walker Ranch and that the Boulder County Open Space Department is not interested in it. What do Mountain Bikers Want? 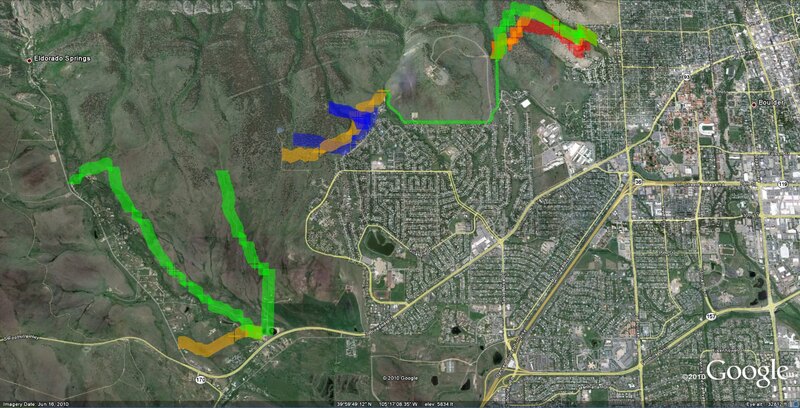 Magnet for mountain bikers is the obvious outcome of any trails opened up for such use just west of CU. It has been my impression that the Mountain Bike Alliance had too much influence in this process, drove the City into make such a boneheaded decision to put the West TSA in “citizens” hands. BMA consistently misleads the public into thinking they are more environmentally conscious than they are. But, as indicated by they’re “council endorsements” last election are all about recreation over conservation. Simply put, it’s was always been about mountain biking. It would be incompatible with other uses and over run with bikes, no matter what a handful of residents decide. This is one decision that should not have ever been put up for a vote. It was a “political” move by The City Of Boulder which has backfired. Nice recounting Alan, but the headline is inaccurate. The Boulder mountain biking community has never told anyone to take a hike. We are open to reasonable and fair compromises to the modest access that we have requested. Real issues in the west TSA such as trail sustainability, user conflict, environmental protection, trailhead congestion, parking, and others are being ignored as if these problems do not exist except in so far as mountain bikers cause them. Let’s get serious about the sustainability and political support for our open space lands and stop perpetuating the false divide between recreationists and preservationists. Trying to find a way to say yes (a.k.a. compromise) to a reasonable request would be a good start. Or please provide more detailed feedback on why the solution here must be absolutely zero access for bikes. Either way, let’s keep talking so we continue to get to know one another and don’t end up in the stereotypical Boulder flame war.